The century that follows the Arab invasion of the peninsula in 711 is probably the darkest in its history as far as the survival of evidence is concerned. There are very few contemporary records, but for the first half of the century there is a reasonably substantial chronicle, known from the date of its final entry as the Chronicle of 754. 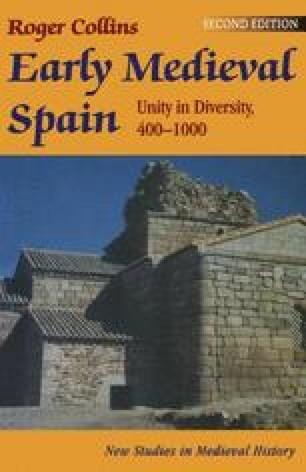 It was very probably compiled in Toledo, which briefly retained its position as the centre of learning in the peninsula, and its author, although anonymous, was clearly a Christian. He knew something of the history of the Visigothic kingdom and cast his work as a continuation of Isidore’s History of the Goths rather than a series of annals. His main sources of information on seventh-century Spain were the secular laws and a collection of conciliar acts, but he was better informed about the history of the Arabs and of the Byzantine Empire. For these he was able to use another continuation of Isidore compiled in all likelihood in Córdoba soon after the date of its final entry in 741. This work, the Chronicle of 741, although written in Spain, concerns itself solely with the history of the Arab Caliphate and the Byzantine Empire. It is conceivable that its author, who wrote in Latin, came from Africa. It is striking how concerned both chronicles are with the deeds of the new conquerors and the author of the Chronicle of 754 in particular was interested in putting their history into the context of that of the recent past of the peninsula, adding it on to the Isidoran tradition.